The Battle on Takodana is definitely one of the best scenes in Star Wars: The Force Awakens. 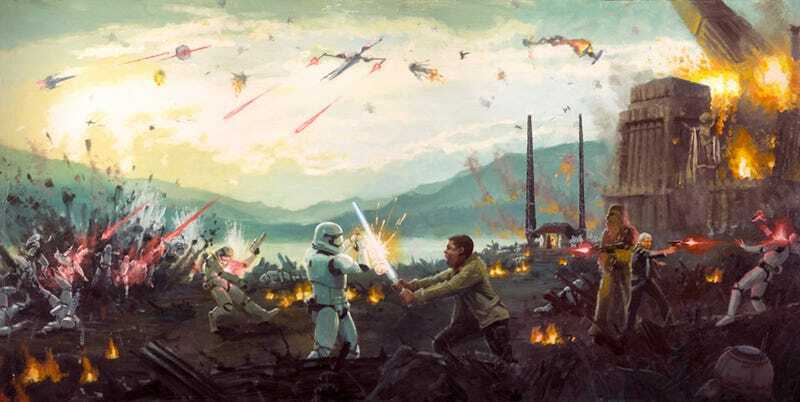 Not only does it have the amazing arrival of the Resistance X-wings, it also features Finn’s lightsaber battle with the stormtrooper nicknamed TR-8R. Now, artist Christopher Clark has immortalized that scene in a beautiful limited piece of art, which you can see above. It’s part of a new batch of Star Wars art just released by Acme Archives. Joel Payne did a great piece based on the Ewok village of Endor. And then artist Randy Martinez dipped his toe into the world of Rogue One: A Star Wars Story with this Death Trooper painting. All of the above pieces are available at this link.